Fast Company – this is a magazine dedicated to the cutting edge of creativity and business. It’ about the daredevils, the outsiders and the creators. About innovation. Inc Magazine – advice, tools and insights on how to work better, perform better and portraits of industry and though leaders. Love that it’s available for iPad. Read about the latest in productivity tools, books, new software and how to create successful businesses in the digital “sphere”. 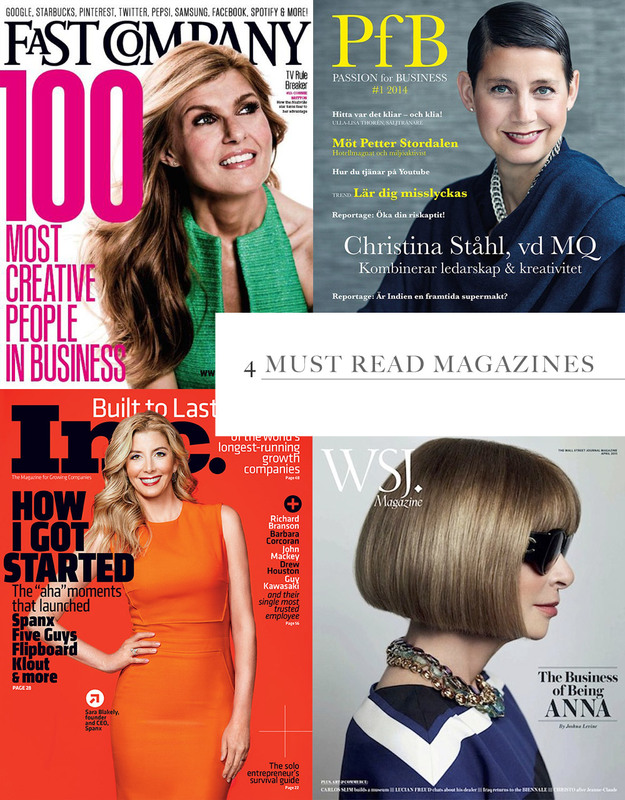 WSJ Magazine – maybe not solely a business magazine. However I love the glossy magazine that accompanies the Saturday issue of Wall Street Journal. The portraits, the articles. It’s always something new to discover and I love the portraits of the business owners they create, how they “encapsule” some of their life-journey in the article. From business innovators turned wine makers it’s not just about business, its about a way of life. I love to read about how other people choose to live outside the “ordinary, this is how you should live your life” box.